Heading To Delhi? These Autos Have Gotten A Wild Makeover & You'll Want To Hop On! You may be fond of the Salman and Aishwarya stickers in your auto rickshaws, and there’s nothing wrong with that. But the artists at Taxi Fabric have changed the way one looks at art within an auto. 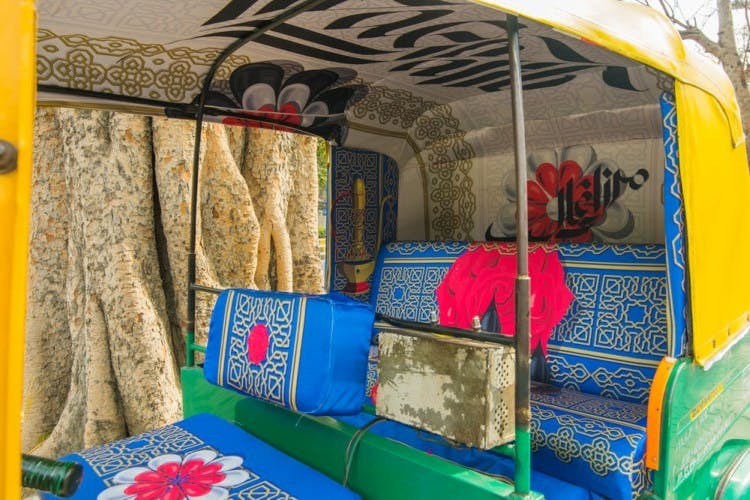 Jyotirmayee Patra of Taxi Fabric, has made what she calls a “Chalti Firti Art Gallery.” Taking Dilli Haat’s splash of colours, and ideas as inspiration, Patra has created an auto-rickshaw burstling with motifs, symbols, and textures. Sanchit Sawaria, another artist at Taxi Fabric, on the other hand, has used Mirza Ghalib’s relationship with the city of Delhi as his reference point. If you’re stuck in traffic, there’s no place you’d rather be, to pass away your time studying the nuances of not only the roof, and sides of the auto, but the very seat you would be sitting on! You can read more about this here, and see all the other works here.